Years ago he came to our church and brought the messages found in this book. It was then I became greatly interested in Brother Carroll’s studies. I, too, had made a special research in Church History, as to which is the oldest Church and most like the churches of the New Testament. He found much church history–most of it seemed to be about the Catholics and Protestants. The history of Baptists, he discovered, was written in blood. They were the hated people of the Dark Ages. Their preachers and people were put into prison and untold numbers were put to death. The world has never seen anything to compare with the suffering, the persecutions, heaped upon Baptists by the Catholic Hierarchy during the Dark Ages. The Pope was the world’s dictator. This is why the Ana-Baptists, before the Reformation, called the Pope The Anti-Christ. The “twelve hundred years” were the years preceding the Reformation in which Rome persecuted Baptists with the most cruel persecution thinkable. This Commission–this work–was not given to the Apostles as individuals, but to them and the others present in their church capacity. The Apostles and the others who heard Him give this Commission were soon dead–BUT, His Church has lived on through the ages, making disciples (getting folks saved), baptizing them, and teaching the truth–the doctrines–He committed to the Jerusalem Church. 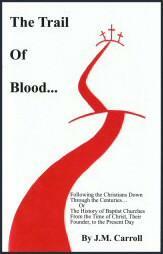 These faithful churches have been blessed with His presence as they have traveled the TRAIL OF BLOOD. This history shows how the Lord’s promise to His churches has been fulfilled. Dr. Carroll shows that churches have been found in every age which have taught the doctrines He committed unto them. Dr. Carroll calls these doctrines the “marks” of New Testament Churches. In any town there are many different churches–all claiming to be the true church. Dr. Carroll did as you can do now–take the marks, or teachings, of the different churches and find the ones which have these marks, or doctrines. The ones which have these marks, or doctrines, taught in God’s Word, are the true churches. 1. What we know today as “Christianity” or the Christian Religion, began with Christ, A.D. 25-30 in the days and within the bounds of the Roman Empire. One of the greatest empires the world has ever known in all its history. 6. I want now to call your attention to some of the landmarks, or ear-marks of this religion–the Christian Religion. If you and I are to trace it down through 20 long centuries, and especially down through 1,200 years of midnight darkness, darkened by rivers and seas of martyr blood, then we will need to know well these marks. They will be many times terribly disfigured. But there will always be some indelible mark. But let us carefully and prayerfully beware. We will encounter many shams and make-believes. If possible, the very elect will be betrayed and deceived. We want, if possible, to trace it down through credible history, but more especially through the unerring, infallible, words and marks of Divine truth. 2. This organization or church, according to the Scriptures and according to the practice of the Apostles and early churches, was given two kinds of officers and only two–pastors and deacons. The pastor was called “Bishop.” Both pastor and deacons to be selected by the church and to be servants of the church. 3. The churches in their government and discipline to be entirely separate and independent of each other, Jerusalem to have no authority over Antioch–nor Antioch over Ephesus; nor Ephesus over Corinth, and so forth. And their government to be congregational, democratic. A government of the people, by the people, and for the people. 4. To the church were given two ordinances and only two, Baptism and the Lord’s Supper. These to be perpetual and memorial. 5. Only the “saved” were to be received as members of the church (Acts 2:47). These saved ones to be saved by grace alone without any works of the law (Eph, 2:5, 8, 9). These saved ones and they only, to be immersed in the name of the Father, Son and Holy Spirit (Matt. 28:19). And only those thus received and baptized, to partake of the Lord’s Supper, and the supper to be celebrated only by the church, in church capacity. 7. Christ Jesus, the founder of this organization and the savior of its members, to be their only priest and king, their only Lord and Lawgiver, and the only head of the churches. The churches to be executive only in carrying out their Lord’s will and completed laws, never legislative, to amend or abrogate old laws or to make new ones. 8. This religion of Christ to be individual, personal, and purely voluntary or through persuasion. No physical or governmental compulsion. A matter of distinct individual and personal choice. “Choose you” is the scriptural injunction. It could be neither accepted nor rejected nor lived by proxy nor under compulsion. 9. Mark well! That neither Christ nor His apostles, ever gave to His followers, what is know today as a denominational name, such as “Catholic,” “Lutheran,” “Presbyterian,” “Episcopal,” and so forth–unless the name given by Christ to John was intended for such, “The Baptist,” “John the Baptist” (Matt. 11:11 and 10 or 12 other times.) Christ called the individual follower “disciple.” Two or more were called “disciples.” The organization of disciples, whether at Jerusalem or Antioch or elsewhere, was called Church. If more than one of these separate organizations were referred to, they were called Churches. The word church in the singular was never used when referring to more than one of these organizations. Nor even when referring to them all. 10. I venture to give one more distinguishing mark. We will call it–Complete separation of Church and State. No combination, no mixture of this spiritual religion with a temporal power. “Religious Liberty,” for everybody. I believe, if you will study carefully this chart, you will better understand the history, and it will greatly aid your memory in retaining what you hear and see. Remember this chart is supposed to cover a period of two thousand years of religious history. Notice at both top and bottom of the chart some figures, the same figures at both top and bottom – 100, 200, 300, and so on to 2,000. They represent the twenty centuries of time–the vertical lines separating the different centuries. Now notice on the chart, near the bottom; other straight lines, this line running left to right, the long way of the chart. The lines are about the same distance apart as the vertical lines. But you can’t see them all the way. They are covered by a very dark spot, representing in history what is known as the “dark ages.” It will be explained later. Between the two lowest lines are the names of countries . . . Italy, Wales, England, Spain, France, and so forth, ending with America. These are names of countries in which much history is made during the period covered by the names themselves. Of course not all the history, some history is made in some of the countries in every period. But some special history is made in these special countries, at these special periods. Now notice again, near the bottom of the chart, other lines a little higher. They, too, covered in part by the “dark ages,” they also are full of names, but not names of countries. They are all “nick-names.” Names given to those people by their enemies. “Christians”–that is the first: “The disciples were called Christians first at Antioch” (Acts 11:26). This occurred about A.D. 43. Either the pagans or Jews gave them that name in derision. All the other names in that column were given in the same manner–Montanists, Novationists, Donatists, Paulicians, Albigenses, Waldenses, etc., and Ana-Baptists. All of these will again and again be referred to as the lectures progress. 4. The first of these changes from New Testament teachings embraced both policy and doctrine. In the first two centuries the individual churches rapidly multiplied and some of the earlier ones, such as Jerusalem, Antioch, Ephesus, Corinth, etc., grew to be very large; Jerusalem, for instance, had many thousand members (Acts 2:41; 4:4, 5:14), possibly 25,000 or even 50,000 or more. A close student of the book of Acts and Epistles will see that Paul had a mighty task even in his day in keeping some of the churches straight. See Peter’s and Paul’s prophecies concerning the future (II Pet. 2:12; Acts 20:29-31. See also Rev., second and third chapters). These great churches necessarily had many preachers or elders (Acts 20:17). Some of the bishops or pastors began to assume authority not given them in the New Testament. They began to claim authority over other and smaller churches. They, with their many elders, began to lord it over God’s heritage (III John 9). Here was the beginning of an error which has grown and multiplied into many other seriously hurtful errors. Here was the beginning of different orders in the ministry running up finally to what is practiced now by others as well as Catholics. Here began what resulted in an entire change from the original democratic policy and government of the early churches. This irregularity began in a small way, even before the close of the second century. This was possibly the first serious departure from the New Testament church order. 14. By the beginning of the year A.D. 313, Christianity has won a mighty victory over paganism. A new emperor has come to the throne of the Roman Empire. He evidently recognized something of the mysterious power of this religion that continued to grow in spite of persecution. History says that this new emperor who was none other than Constantine had a wonderful realistic vision. He saw in the skies a fiery red cross and on that cross written in fiery letters these words–“By this thou shalt conquer.” He interpreted it to mean that he should become a Christian. And that by giving up paganism and that by attaching the spiritual power of the Christian religion onto the temporal power of the Roman Empire the world could be easily conquered. Thus the Christian religion would in fact become a whole world religion, and the Roman Empire a whole world empire. 19. When this hierarchy was created, Constantine, who was made its head, was not himself at that time a Christian. He had agreed to become one. But as the erring or irregular churches which had gone with him into this organization had come to adopt the error of Baptismal regeneration, a serious question arose in the mind of Constantine, “If I am saved from my sins by baptism, what is to become of my sins which I may commit after I am baptized?” He raised a question which has puzzled the world in all succeeding generations. Can baptism wash away yet uncommitted sins? Or, are the sins committed prior to baptism washed away by one method (that is, baptism), and the sins committed subsequent to baptism washed away by another method? 21. Constantine’s action in repudiating for the whole Roman Empire, the pagan religion, and accepting Christianity incurred the hot displeasures of the Roman Senate. They repudiated, or, at least opposed his course. And their opposition finally resulted in the removal of the seat of empire from Rome to Byzantium, an old city rebuilt and then renamed Constantinople for Constantine. As a result there came to be two capital cities of the Roman Empire–Rome and Constantinople. The two rival cities several centuries later became the ruling centers of the divided Catholic church–Roman and Greek. 25. As an inevitable consequence of this new doctrine and law, these erring churches were soon filled with unconverted members. In fact, it was not very many years until probably a majority of the membership was composed of unconverted material. So the great spiritual affairs of God’s great spiritual kingdom were in the hands of an unregenerate temporal power. What may now be expected? 26. Loyal Christians and churches, of course, rejected this new law. “Believers baptism,” of course, “New Testament baptism,” was the only law for them. They not only refused to baptize their own children, but believing in the baptism of believers only, they refused to accept the baptizing done by and within the churches of this unscriptural organization. If any of the members from the churches of this new organization attempted to join any of the churches which had refused to join in with the new organization, a Christian experience and a rebaptism was demanded. 28. A.D. 426, just ten years after the legal establishment of infant baptism, the awful period known as the “Dark Ages” had its beginning. What a period! How awfully black and bloody! From now on for more than a decade of centuries, the trail of loyal Christianity is largely washed away in its own blood. Note on the chart some of the many different names borne by the persecuted. Sometimes these names are given because of some specially heroic leader and sometimes from other causes, and frequently names for the same people vary in different countries and even in different centuries. 29. It was early in the period of the “dark ages” when real Popery had its definite beginnings. This was by Leo II, A.D. 440 to 461. This, however, was not the first time the title was ever used. This title, similar to the Catholic church itself, was largely a development. The name appears, as first applied to the Bishop of Rome 296-304. It was formally adopted by Siricius, Bishop of Rome 384-398. Then officially adopted by Leo II, 440-461. Then claimed to be universal, 707. Then some centuries later declared by Gregory VII to be the exclusive right of the papacy. (8) The “Dark Ages” begin 426. (10) All semblance of “Religious liberty” dies and is buried and remains buried for many centuries. 1. We closed the first Lecture with the close of the fifth century. And yet a number of things had their beginnings back in those early centuries, which were not even mentioned in the first Lecture. We had just entered the awful period known in the world’s history as “The Dark Ages.” Dark and bloody and awful in the extreme they were. The persecutions by the established Roman Catholic Church are hard, cruel and perpetual. The war of intended extermination follows persistently and relentlessly into many lands, the fleeing Christians. A “Trail of Blood” is very nearly all that is left anywhere. Especially throughout England, Wales, Africa, Armenia, and Bulgaria. And anywhere else Christians could be found who were trying earnestly to remain strictly loyal to New Testament teaching. 2. We now call attention to these Councils called “Ecumenical,” or Empire wide. It is well to remember that all these Councils were professedly based upon, or patterned after the Council held by the Apostles and others at Jerusalem (see Acts 15:1), but probably nothing bearing the same name could have been more unlike. We here and now call attention to only eight, and these were all called by different Emperors, none of them by the Popes. And all these held among the Eastern or Greek churches. Attended, however, somewhat by representatives from the Western Branch or Roman Churches. The Seventh Council was called to meet at Nicea A.D. 787. This was the second held at this place. The Empress Irene called this one. Here in this meeting seems to have been the definite starting place, of both “Image Worship” and “Saints Worship.” You can thus see that these people were getting more markedly paganized than Christianized. The last of what were called the “Eastern Councils,” those, called by the Emperors, was held in Constantinople, in A.D. 869. This was called by Basilius Maredo. The Catholic Church had gotten into serious trouble. There had arisen a controversy of a very serious nature between the heads of the two branches of Catholicism–the Eastern and Western, Greek and Roman–Pontius the Greek at Constantinople and Nicholas the 1st at Rome. So serious was their trouble, that they had gone so far as to excommunicate each other. So for a short time Catholicism was entirely without a head. The council was called mainly to settle, if possible, this difficulty. This break in the ranks of Catholicism has never, even to this day, been satisfactorily settled. Since that far away day, all attempts at healing that breach have failed. The Lateran-power since then has been in the ascendancy. Not the Emperors, but the Roman Pontiffs calling all Councils. The later Councils will be referred to later in these lectures. 4. There is one new doctrine to which we have failed to call attention. There are doubtless others but one especially–and that “Infant Communion.” Infants were not only baptized, but received into the church, and being church members, they were supposed to be entitled to the Lord’s Supper. How to administer it to them was a problem, but it was solved by soaking the bread in the wine. Thus it was practiced for years. And after awhile another new doctrine was added to this–it was taught that this was another means of Salvation. As still another new doctrine was later added to these, we will again refer to this a little later in the lectures. 5. During the 5th Century, at the fourth Ecumenical Council, held at Chalcedon, 451, another entirely new doctrine was added to the rapidly growing list–the doctrine called “Mariolatry,” or the worship of Mary, the Mother of Jesus. A new mediator seems to have been felt to be needed. The distance from God to man was too great for just one mediator, even though that was Christ, God’s Son, the real God-Man. Mary was thought to be needed as another mediator, and prayers were to be made to Mary. She was to make them to Christ. 6. Two other new doctrines were added to the Catholic faith in the 8th Century. These were promulgated at the Second Council held at Nicea (Nice), the Second Council held there (787). The first of these was called “Image Worship, a direct violation of one of the commands of God. “Thou shalt not make unto thee any graven image,” (Ex. 20:3, 4, 5). Another addition from Paganism. Then followed the “worship of Saints.” This doctrine has no encouragement in the Bible. Only one instance of Saint worship is given in the Bible and that is given to show its utter folly–the dead rich man praying to Abraham, (Luke 16:24-3l). These are some, not all of the many revolutionary changes from New Testament teachings, that came about during this period of Church history. 9. Furthermore, during all the period of the “Dark Ages,” and the period of the persecution, strenuous efforts were made to destroy even what Scripture manuscripts the persecuted did possess. Hence in many instances these people had only small parts of the Bible. 10. It is well to note also that in order to prevent the spread of any view of any sort, contrary to those of the Catholics very extreme plans and measures were adopted. First, all writings of any sort, other than those of the Catholics, were gathered and burned. Especially was this true of books. For several centuries these plans and measures were strictly and persistently followed. That is, according to history, the main reason why it is so difficult to secure accurate history. About all persistent writers and preachers also died martyr deaths. This was a desperately bloody period. All of the groups of persistent heretics (So-called) by whatever name distinguished, and wherever they had lived, were cruelly persecuted. The Donatists and Paulicians, were prominent among the earlier groups. The Catholics, strange as it may seem, accused all who refused to depart from the faith with them, believe with them–accused them of being heretics, and then condemned them as being heretics. Those called Catholics became more thoroughly paganized and Judaized than they were Christianized, and were swayed far more by civil power, than they were by religious power. They made far more new laws, than they observed old ones. 11. The following are a few of the many new variations that came about in New Testament teachings during these centuries. They are probably not always given in the order of their promulgation. In fact it would sometimes be next to impossible to get the exact date of the origin of some of these changes. They have been somewhat like the whole Catholic system. They are growths of development. In the earlier years especially, their doctrines or teachings were subject to constant change–by addition or subtraction, or substitution or abrogation. The Catholic Church was now no longer, even if it had ever been, a real New Testament Church. It no longer was a purely executive body, to carry out the already made laws of God, but had become actively legislative, making new ones, changing or abrogating old ones at will. 12. One of their new doctrines or declarations about this time was “There is no salvation outside of the Church”–the Catholic Church, of course, as they declared there was no other–be a Catholic or be lost. There was no other alternative. 13. The doctrine of Indulgences and the Sale of Indulgences was another absolutely new and serious departure from New Testament teachings. But in order to make that new teaching really effective, still another new teaching was imperatively necessary: A very large Credit Account must somehow be established–a credit account in heaven, but accessible to earth. So the merit of “good works” as a means of Salvation must be taught, and as a means of filling up, putting something in the credit account, from which something could be drawn. The first large sum to go into the account in heaven was of course the work of the Lord Jesus. As He did no evil, none of His good works were needed for Himself, so all His good works could and would of course, go into the credit account. And then in addition to that, all the surplus good works (in addition to what each might need for himself) by the Apostles, and by all good people living thereafter, would be added to that credit account, making it enormously large. And then all this immense sum placed to the credit of the church–the only church(?)! and permission given to the church to use as needed for some poor sinning mortal, and charging for that credit as much as might be thought wise, for each one needed the heavenly credit. Hence came the Sale of Indulgences. Persons could buy for themselves or their friends, or even dead friends. The prices varied in proportion to the offense committed–or to be committed. This was sometimes carried to a desperate extreme, as admitted by Catholics themselves. Some histories or Encyclopedias give a list of prices charged on different sins for which Indulgences were sold. 14. Yet another new doctrine was necessary, yea imperative, to make thoroughly effective the last two. That new doctrine is called Purgatory, a place of intermediate state between heaven and hell, at which all must stop to be cleansed from all sins less than damning sins. Even the “Saints” must go through purgatory and must remain there until cleansed by fire–unless they can get help through that credit account, and that they can get only through the prayers or the paying for Indulgences, by those living. Hence the Sale of Indulgences. One departure from New Testament teachings lead inevitably to others. (4) The Greeks in administering the Lord’s Supper give the wine as well as the bread to the laity. The Romans give the bread only to the laity–the priests drink the wine. (6) The Greeks reject the doctrine of Papal “Infallibility,” the Romans accept and insist upon that doctrine. The above are at least the main points on which they differ–otherwise the Greek and Roman Catholic churches, it seems, would stand together. 17. I again call your attention to those upon whom the hard hand of persecution fell. If fifty million died of persecution during the 1,200 years of what are called the “Dark Ages,” as history seems positively to teach–then they died faster than an average of four million every one hundred years. That seems almost beyond the limit of, human conception. As before mentioned, this iron hand, dripping with martyr blood, fell upon Paulicians, Arnoldists, Henricians, Petro Brussians, Albigenses, Waldenses and Ana-Baptists–of course much harder upon some than others. But this horrid part of our story we will pass over hurriedly. 18. There came now another rather long period of Ecumenical Councils, of course not continuously or consecutively. There were all through the years many councils that were not Ecumenical, not “Empire Wide.” These Councils were largely legislative bodies for the enactment or amendment of some civil or religious (?) laws, all of which, both the legislation and the laws, were directly contrary to the New Testament. Remember these were the acts of an established church–a church married to a Pagan government. And this church has become far more nearly paganized than the government has become Christianized. “For I certify unto every man that heareth the words of this book, if any man shall add unto these things, God shall add unto him the plagues that are written in this book. And if any man shall take away from the words of the book of this prophecy, God shall take away his part out of the book of life, and out of the Holy City, and from the things which are written in the book.” Rev. 22:18, 19. 23. Alexander III called yet another, A.D. 1179, just forty years after the last. In that was condemned what they called the “Errors and Impieties” of the Waldenses and Albigenses. 24. Just 36 years after this last one, another was called by Pope Innocent III. This was held A.D. 1215, and seems to have been the most largely attended of possibly any of these great councils. According to the historical account of this meeting, “there were present 412 bishops, 800 Abbots and priors, Ambassadors from the Byzantine court, and a great number of Princes and Nobles.” From the very make-up of this assembly you may know that spiritual matters were at least not alone to be considered. At that time was promulgated the new doctrine of “Transubstantiation,” the intended turning of the bread and wine of the Lord’s Supper into the actual and real body and blood of Christ, after a prayer by the priest. This doctrine among others, had much to do with stirring up the leaders of the Reformation a few centuries later. This doctrine of course taught that all those who participated in the supper actually ate of the body and drank of the blood of Christ. Auricular confession–confessing one’s sins into the ear of a priest–was another new doctrine seemingly having its beginning at this meeting. But probably the most cruel and bloody thing ever brought upon any people in all the world’s history was what is known as the “Inquisition,” and other similar courts, designed for trying what was called “heresy.” The whole world is seemingly filled with books written in condemnation of that extreme cruelty, and yet it was originated and perpetuated by a people claiming to be led and directed by the Lord. For real barbarity there seems to be nothing, absolutely nothing in all history that will surpass it. I would not even attempt to describe it. I will simply refer my readers to some of the many books written on the “Inquisition” and let them read and study for themselves. And yet another thing was done at this same meeting, as if enough had not been done. It was expressly decreed to extirpate all “heresy.” What a black page–yea–many black pages were written into the world’s history by these terrible decrees. 1. These three centuries, fifteenth, sixteenth, and seventeenth, are among the most eventful in all the world’s history, and especially is this true in Christian history. There was almost a continual revolution inside the Catholic Church–both Roman and Greek–seeking a Reformation. This awakening of long dormant Conscience and the desire for a genuine reformation really began in the thirteenth century or possibly even a little earlier than that. History certainly seems to indicate it. 2. Let’s go back just a little. The Catholic Church by its many departures from New Testament teachings, its many strange and cruel laws, and its desperately low state of morals, and its hands and clothes reeking with the blood of millions of martyrs, has become obnoxious and plainly repulsive to many of its adherents, who are far better than their own system and laws and doctrines and practices. Several of its bravest and best and most spiritual priests and other leaders, one by one, sought most earnestly to reform many of its most objectionable laws and doctrines and get back, at least nearer, to the plain teachings of the New Testament. We give some striking examples. Note, not only how far apart and where the reformatory fires began, but note also the leaders in the reformation. The leaders were, or had been, all Catholic priests or officials of some kind. There was, even yet, a little of good in the much evil. However, at this time there was probably not one solitary unmarred doctrine of the New Testament retained in its original purity–but now note some of the reformers and where they labored. 4. From 1320 to 1384 there lived a man in England who attracted world-wide attention. His name was John Wycliff. He was the first of the brave fellows who had the courage to attempt a real reformation inside the Catholic Church. He is many times referred to in history as “The Morning Star of the Reformation.” He lived an earnest and effective life. It would really require several volumes to contain anything like an adequate history of John Wycliff. He was hated, fearfully hated, by the leaders of the Catholic hierarchy. His life was persistently sought. He finally died of paralysis. But years later, so great was Catholic hatred, his bones were dug and burned, and his ashes scattered upon the waters. 5. Following tolerably close on the heels of Wycliff came John Huss, 1373-1415, a distinguished son from far away Bohemia. His soul had felt and responded to the brilliant light of England’s “Morning Star.” His was a brave and eventful life, but painfully and sadly short. Instead of awakening a responsive chord among his Catholic people in favor of a real reformation, he aroused a fear and hatred and opposition which resulted in his being burned at the stake–a martyr among his own people. And yet he was seeking their own good. He loved his Lord and he loved his people. However, he was only one of many millions who had thus to die. 6. Next to John Huss of Bohemia, came a wonderful son of Italy, the marvelously eloquent Savonarola, 1452-1498. Huss was burned in 1415, Savonarola was born 37 years later. He, like Huss, though a devout Catholic, found the leaders of his people–the people of Italy–like those of Bohemia, against all reformation. But he, by his mighty eloquence, succeeded in awakening some conscience and securing a considerable following. But a real reformation in the Hierarchy meant absolute ruin to the higher-ups in that organization. So Savonarola, as well as Huss, must die. HE TOO WAS BURNED AT THE STAKE. Of all the eloquent men of that great period, Savonarola possibly stood head and shoulders above all others. But he was contending against a mighty organization and their existence demanded that they fight the reformation, so Savonarola must die. 7. Of course, in giving the names of the reformers of this period, many names are necessarily to be left out. Only those most frequently referred to in history are mentioned here. Following Italy’s golden tongued orator came a man from Switzerland. Zwingle was born before Savonarola died. He lived from 1484 to 1531. The spirit of reformation was beginning now to fill the whole land. Its fires are now breaking out faster and spreading more rapidly and becoming most difficult to control. This one kindled by Zwingle was not yet more than partially smothered before another, more serious than all the rest, had broken out in Germany. Zwingle died in battle. 10. Skipping now for a little while, the Church of England, which comes next to the Lutheran in its beginnings, we will follow for a little while the Reformation on the Continent. From 1509 to 1564, there lived another of the greatest of the reformers. This was John Calvin, a Frenchman, but seeming at the time to be living in Switzerland. He was really a mighty man. He was a contemporary of Martin Luther for 30 years, and was 22 years old when Zwingle died. Calvin is the accredited founder of the Presbyterian church. Some of the historians, however, give that credit to Zwingle, but the strongest evidence seems to favor Calvin. Unquestionably the work of Zwingle, as well as that of Luther, made much easier the work of Calvin. So in 1541, just eleven years (that seems to be the year), after the founding by Luther of the Lutheran Church, the Presbyterian Church came into existence. It too, as in the case of the Lutherans, was led by a reformed Catholic priest or at least official. These six–Wycliff, Huss, Savonarola, Zwingle, Luther and Calvin, great leaders in their great battles for reformation, struck Catholicism a staggering blow. 11. In 1560, nineteen years after Calvin’s first organization in Geneva, Switzerland, John Knox, a disciple of Calvin, established the first Presbyterian Church in Scotland, and just thirty-two years later, 1592, the Presbyterian became the State Church of Scotland. England’s king, Henry VIII, had married Catherine of Spain, but unfortunately, after some time his somewhat troublesome heart had fallen in love with Anne Boleyn. So he wanted to divorce Catherine and marry Annie. Getting a divorce back then was no easy matter. Only the Pope could grant it, and he in this case, for special reasons, declined to grant it. Henry was in great distress. Being king, he felt he ought to be entitled to follow his own will in the matter. His Prime Minister (at that time Thomas Cromwell) rather made sport of the King. Why do you submit to papal authority on such matters? Henry followed his suggestion, threw off papal authority and made himself head of the Church of England. Thus began the new Church of England. This was consummated in 1534 or 1535. At that time there was no change in doctrine, simply a renunciation of the authority of the Pope. Henry at heart really never became a Protestant. He died in the Catholic faith. 14. But this split did ultimately result in some very considerable change, or reformation, While a reformation within the Catholic Church and under papal authority, as in the case of Luther and others, was impossible, it became possible after the division. Cranmer, Latimer, Ridley and others led in some marked changes. However, they and many others paid a bloody price for the changes when a few years later, Mary, “Bloody Mary,” a daughter of the divorced Catherine, came to the English throne, and carried the new Church back under the papal power. This fearful and terrific reaction ended with the strenuous and bloody five-year reign of Mary. While the heads were going under the bloody axe of Mary, hers went with them. The people had gotten, however, a partial taste of freedom so when Elizabeth, the daughter of Anne Boleyn (for whom Catherine was divorced), became Queen, the Church of England again overthrew papal power and was again re-established. 15. Thus, before the close of the Sixteenth Century, there were five established Churches–churches backed up by civil governments–the Roman and Greek Catholics counted as two; then the Church of England; then the Lutheran, or Church of Germany; then the Church of Scotland, now known as the Presbyterian. All of them were bitter in their hatred and persecution of the people called Ana-Baptists, Waldenses and all other non-established churches, churches which never in any way had been connected with the Catholics. Their great help in the struggle for reformation had been forgotten, or was now wholly ignored. Many more thousands, including both women and children were constantly perishing every day in the yet unending persecutions. The great hope awakened and inspired by the reformation had proven to be a bloody delusion. Remnants now find an uncertain refuge in the friendly Alps and other hiding places over the world. 17. In the beginning all these established Churches persecuted one another as well as every one else, but at a council held at Augsburg in 1555, a treaty of peace, known as the “Peace of Augsburg” was signed between the “Catholics” on the one hand, and the “Lutherans” on the other, agreeing not to persecute each other. You let us alone, and we will let you alone. For Catholics to fight Lutherans meant war with Germany, and for Lutherans to fight or persecute Catholics meant war with all the countries where Catholicism predominated. 19. Let it be remembered that the Catholics do not regard the Bible as the sole rule and guide of faith and life. The claim that it is indeed unerring, but that there are two other things just as much so, the “Writings of the Fathers” and the decrees of the Church (Catholic Church) or the declarations of the Infallible Pope. 20. Take as an example the question of “Baptism” and the final authority for the act and for the mode. They claim that the Bible unquestionably teaches Baptism and that it teaches immersion as the only mode. But they claim at the same time that their unerring Church had the perfect right to change the mode from immersion to sprinkling but that no others have the right or authority, none but the infallible papal authority. 22. It is well just here to call attention to facts concerning the Bible during these awful centuries. Remember the Bible was not then in print and there was no paper upon which to have printed even if printing had been invented. Neither was there any paper upon which to write it. Parchment, dressed goat of sheep skins, or papyrus (some kind of wood pulp), this was the stuff used upon which to write. So a book as big as the Bible, all written by hand and with a stylus of some sort, not a pen like we use today, was an enormous thing, probably larger than one man could carry. There were never more than about thirty complete Bibles in all the world. Many parts or books of the Bible like Matthew, Mark, Luke, John, or Acts, or some one of the Epistles, or Revelation or some one book of the Old Testament. One of the most outstanding miracles in the whole world’s history–according to my way of thinking–is the nearness with which God’s people have thought and believed together on the main and vital points of Christianity. Of course God is the only solution. It is now a most glorious fact that we can all and each, now have a full copy of the whole Bible and each in our own native tongue. 23. It is well also for us all to do some serious and special thinking on another vital fact concerning the Bible. It has already been briefly mentioned in the lecture preceding this, but is so very vital that it will probably be wise to refer to it again. It was the action taken by the Catholics at the Council of Toulouse, held in 1229 A. D., when they decided to withhold the Bible, the Word of God from the vast majority of all their own people, the “Laymen.” I am simply stating here just what they stated in their great Council. But lately in private a Catholic said to me, “Our purpose in that is to prevent their private interpretation of it.” Isn’t it marvelous that God should write a book for the people and then should be unwilling for the people to read it. And yet according to that book the people are to stand or fall in the day of judgment on the teachings of that book. No wonder the declaration in the book–“Search the Scriptures (the book) for in them ye think ye have eternal life. And they are they which testify of me.” Fearful the responsibility assumed by the Catholics! 2. This three-century period begins with the rise of an entirely new denomination. It is right to state that some historians give the date of the beginning of the Congregational Church (at first called “Independents”) as 1602. However, Schaff-Herzogg, in their Encyclopedia, place its beginning far back in the sixteenth century, making it coeval with the Lutheran and Presbyterian. In the great reformation wave many who went out of the Catholic Church were not satisfied with the extent of the reformation led by Luther and Calvin. They decided to repudiate also the preacher rule and government idea of the churches and return to the New Testament democratic idea as had been held through the fifteen preceding centuries by those who had refused to enter Constantine’s hierarchy. 3. The determined contention of this new organization for this particular reform brought down upon its head bitter persecution from Catholic, Lutheran, Presbyterian and Church of England adherents–all the established churches. However, it retained many other of the Catholic made errors, such for instance as infant baptism, pouring or sprinkling for baptism, and later adopted and practiced to an extreme degree the church and state idea. And, after refugeeing to America, themselves, became very bitter persecutors. 7. In 1648 came the “Peace of Westphalia.” Among other things which resulted from that peace pact was the triple agreement between the great denominations–Catholic, Lutheran and Presbyterian, no longer to persecute one another. Persecutions among these denominations meant war with governments backing them. However, all other Christians, especially the Ana-Baptists, were to continue to receive from them the same former harsh treatment, persistent persecution. 8. During all the seventeenth century, persecutions for Waldenses, Ana-Baptists, and Baptists (in some places the “Ana” was now being left off) continued to be desperately severe; in England by the Church of England, as John Bunyan and many others could testify; in Germany by the Lutherans; in Scotland by the Church of Scotland (Presbyterian); in Italy, in France, and in every other place where the papacy was in power, by the Catholics. There is now no peace anywhere for those who are not in agreement with the state churches, or some one of them. 9. It is a significant fact well established in credible history that even as far back as the fourth century those refusing to go into the Hierarchy, and refusing to accept the baptism or those baptized in infancy, and refusing to accept the doctrine of “Baptismal Regeneration” and demanding rebaptism for all those who came to them from the Hierarchy, were called “Ana-Baptists.” No matter what other names they then bore, they were always referred to as “Ana-Baptists.” Near the beginning of the sixteenth century, the “Ana” was dropped, and the name shortened to simply “Baptist,” and gradually all other names were dropped. Evidently, if Bunyan had lived in an earlier period his followers would have been called “Bunyanites” or “Ana-Baptists.” Probably they would have been called by both names as were others preceding him. 10. The name “Baptist” is a “nickname,” and was given to them by their enemies (unless the name can be rightfully attributed to them as having been given to them by the Savior Himself, when He referred to John as “The Baptist”). To this day, the name has never been officially adopted by any group of Baptists. The name, however, has become fixed and is willingly accepted and proudly borne. It snugly fits. It was the distinguishing name of the forerunner of Christ, the first to teach the doctrine to which the Baptists now hold. The Gospel was carried to England by the Apostles and it remained Apostolic in its religion until after the organization of the Hierarchy in the beginning of the fourth century, and really for more than another century after that. It then came under the power of the Hierarchy which was rapidly developing into the Catholic Church. It then remained Catholic–that was the state religion, until the split in 1534-1535, during the reign of Henry VIII. It was then called the Church of England. Eighteen years later, 1553-1558, during the reign of Queen Mary (“Bloody Mary”) England was carried back to the Catholics, and a bloody five-years period was this. Then Elizabeth, a half-sister of Mary, the daughter of Anna Boleyn, came to the throne, 1558. The Catholics were again overthrown, and again the Church of England came into power. And thus things remained for almost another century, when the Presbyterian Church came for a short while into the ascendancy, and seemed for a while as if it might become the State Church of England as well as that of Scotland. However, following the time of Oliver Cromwell, the Church of England came back to her own and has remained the established church of England ever since. (1) The first toleration act came in 1688, one hundred and fifty-four years after the beginning of this church. This act permitted the worship of all denominations in England except two–the Catholics and the Unitarians. (4) In 1828-1829 came what is known as the “Test Act” which gave the “dissenters” (the religionists not in accord with the “Church of England”) access to public office and even to Parliament. (6) The “Reform Bill” came in 1854. This bill opened the doors of Oxford and Cambridge Universities to dissenting students. Up to this time no child of a “dissenter” could enter one of these great institutions. 14. Thus has been the march of progress in England toward “Religious Liberty.” But it is probably correct to state that real religious liberty can never come into any country where there is and is to remain an established church. At best, it can only be toleration, which is certainly a long way from real religious liberty. As long as one denomination among several in any country is supported by the government to the exclusion of all others this favoritism and support of one, precludes the possibility of absolute religious liberty and equality. 16. These men seemed to have no desire to be the founders of a new denomination. But they did seem to greatly desire and earnestly strive for a revival of pure religion and a genuine spiritual reformation in the Church of England. This they tried in both England and America. The doors of their own churches were soon closed against them. Their services were frequently held out in the open, or in some private house, or, as especially in the case of Whitfield, in the meeting houses of other denominations. Whitfield’s great eloquence attracted markedly great attention everywhere he went. 17. The definite date of the founding of the Methodist Church is hard to be determined. Unquestionably Methodism is older than the Methodist Church. The three young men were called Methodists before they left college. Their first organizations were called “Societies.” Their first annual conference in England was held in 1744. The Methodist Episcopal Church was officially and definitely organized in America, in Baltimore in 1784. Their growth has really been marvelous. But, when they came out of the Church of England, or the Episcopal Church, they brought with them a number of the errors of the mother and grandmother churches. For instance, as the Episcopacy, or preacher-church government. On this point they have had many internal wars and divisions, and seem destined to have yet others. Infant Baptism and sprinkling for baptism, etc., but there is one great thing which they have, which they did not bring out with them, a genuine case of spiritual religion. 18. September 12, 1788, there was born in Antrium, Ireland, a child, who was destined in the years to come, to create quite a religious stir in some parts of the world, and to become the founder of a new religious denomination. That child was Alexander Campbell. His father was a Presbyterian minister. The father, Thomas Campbell, came to America in 1807. Alexander, his son, who was then in college, came later. Because of changed views, they left the Presbyterians and organized an independent body, which they called “The Christian Association,” known as “The Brush Run Church.” In 1811, they adopted immersion as baptism and succeeded in persuading a Baptist preacher to baptize them, but with the distinct understanding that they were not to unite with the Baptist Church. The father, mother, and Alexander were all baptized. In 1813 their independent church united with the Red Stone Baptist Association. Ten years later, because of controversy, they left that association and joined another. Controversies continued to arise, and they left that association. It is fair to say that they had never been Baptists, nor had they so far as any records I have seen, to show, ever claimed to be. 19. It could hardly be fair to Christian history, and especially to Baptist history, to say nothing in these lectures about John Bunyan. In some respects, one of the most celebrated men in English history and even in world history–John Bunyan, a Baptist preacher–John Bunyan, twelve years in Bedford jail–John Bunyan the author while confined in jail, of the most celebrated and most widely circulated book, next to the Bible, in the whole world. “Pilgrim’s Progress”–John Bunyan, one of the most notable of all examples of the bitterness of Christian persecution. And the story of Mary Bunyan, John Bunyan’s blind daughter, ought to be in every Sunday School library. For many years it was out of print. I think it is now in print again. I almost defy any man or woman, boy or girl, to read it and keep dry eyes. 21. The story of the beginning of Christian work in Wales is strikingly fascinating and from history it seems to be true. That history begins in the New Testament (Acts 28:30-31; II Tim. 4:21). The story of Claudia and Pudens–their visit to Rome–their conversion under Paul’s preaching, and carrying the gospel back to Wales, their homeland, is thrillingly interesting. Paul did this preaching in Rome as early as A.D. 63. Soon after that Claudia, Pudens, and others, among them two preachers, carried the same gospel into England and especially into Wales. How mightily the Welch Baptists have helped the Baptists in America can hardly be estimated. 2. Beginning with the Colonial period, in the early part of the seventeenth century, the first settlements were established in Virginia, and a little later in that territory now known as the New England States. Religious, or more properly speaking–irreligious persecutions, in England, and on the continent, were, at least, among the prime causes which led to the first settlement of the first United States Colonies. In some of the groups of immigrants which first came, not including the Jamestown group (1607) and those known as the “Pilgrims” (1620), were two groups, one, at least, called “Puritans”–these were “Congregationalists.” Governor Endicott was in control of their colony. The other group were Presbyterians. Among these two groups, however, were a number of Christians with other views than theirs, also seeking relief from persecution. 3. These refugeeing Congregationalists and Presbyterians established different Colonies and immediately within their respective territories established by law their own peculiar religious views. In other words, “Congregationalism” and “Presbyterianism” were made the legal religious views of their colonies. This to the absolute exclusion of all other religious views. Themselves fleeing the mother country, with the bloody marks of persecution still upon them and seeking a home of freedom and liberty for themselves, immediately upon being established in their own colonies, in the new land and having the authority, they deny religious liberty to others, and practice upon them the same cruel methods of persecution. Especially did they, so treat the Baptists. 5. With the immigrants to America came many scattering Baptists (by some still called “Ana-Baptists”). There were probably some in every American-bound vessel. They came, however, in comparatively small groups, never in large colonies. They would not have been permitted to come in that way. But they kept coming. Before the colonies are thoroughly established the Baptists are numerous and almost everywhere. But they soon began to feel the heavy hands of the three State churches. For the terrible offenses of “preaching the Gospel” and “refusing to have their children baptized,” “opposing infant baptism,” and other like conscientious acts on their part, they were arrested, imprisoned, fined, whipped, banished, and their property confiscated, etc. All that here in America. From many sources, I give but a few illustrations. “It is ordered and agreed, that if any person or persons, within this jurisdiction, shall either openly condemn or oppose the baptizing of infants, or go about secretly to seduce others from the approbation or use thereof, or shall purposely depart the congregation at the ministration of the ordinance . . . after due time and means of conviction–every such person or persons shall be sentenced to banishment.” This law was enacted especially against the Baptists. 12. As to the persecutions in some of the American colonies, we give a few samples. It is recorded that on one occasion one of John Clarke’s members was sick. The family lived just across the Massachusetts Bay Colony line and just inside that colony. John Clarke, himself, and a visiting preacher by the name of Crandall and a layman by the name of Obediah Holmes–all three went to visit that sick family. While they were holding some kind of a prayer service with that sick family, some officer or officers of the colony came upon them and arrested them and later carried them before the court for trial. It is also stated, that in order to get a more definite charge against them, they were carried into a religious meeting of their church (Congregationalist), their hands being tied (so the record states). The charge against them was “for not taking off their hats in a religious service.” They were all tried and convicted. Gov. Endicott was present. In a rage he said to Clarke, while the trial was going on, “You have denied infants baptism” (this was not the charge against them). “You deserve death. I will not have such trash brought into my jurisdiction.” The penalty for all was a fine, or be well-whipped. Crandall’s fine (a visitor) was five pounds ($25.00), Clarke’s fine (the pastor) was twenty pounds ($100.00). Holmes’ fine (the records say he had been a Congregationalist and had joined the Baptists) so his fine was thirty pounds ($150.00). Clark’s and Crandall’s fines were paid by friends. Holmes refused to allow his fine paid, saying he had done no wrong, so was well whipped. The record states that he was “stripped to the waist” and then whipped (with some kind of a special whip) until the blood ran down his body and then his legs until his shoes overflowed. The record goes on to state that his body was so badly gashed and cut that for two weeks he could not lie down, so his body could touch the bed. His sleeping had to be done on his hands or elbows and knees. Of this whipping and other things connected with it I read all records, even Holmes’ statement. A thing could hardly have been more brutal. And here in America! It was decided by authorities of the colony to build a Presbyterian meeting house in that Baptist settlement. The only way to do it seemed by taxation. The Baptists recognized the authority of the Presbyterians to levy this new and extra tax, but they made this plea against the tax at this time–“We have just started our settlement. Our little cabins have just been built, and little gardens and patches just been opened. Our fields not cleared. We have just been taxed to the limit to build a fort for protection against the Indians. We cannot possibly pay another tax now.” This is only the substance of their plea. The tax was levied. It could not possibly be paid at that time. An auction was called. Sales were made. Their cabins and gardens and patches, and even their graveyards, were sold–not their unopened fields. Property valued at 363 pounds and 5 shillings sold for 35 pounds and 10 shillings. Some of it, at least, was said to have been bought by the preacher who was to preach there. The settlement was said to have been left ruined. 16. We give some examples of the hardships of the Baptists in Virginia, and yet strange as it may now seem Virginia was the next place on earth after Rhode Island to adopt religious liberty. But that was more than a century away. But the hardships–as many as 30 preachers at different times, were put in jail with the only charge against them–“for preaching the Gospel of the Son of God.” James Ireland is a case in point. He was imprisoned. After imprisonment, his enemies tried to blow him up with gunpowder. That having failed, they next tried to smother him to death by burning sulphur under his windows at the jail. Failing also in this, they tried to arrange with a doctor to poison him. All this failed. He continued to preach to his people from the windows. A wall was then built around his jail so the people could not see in nor he see out, but even that difficulty was overcome. The people gathered, a handkerchief was tied to a long stick, and that stuck up above the walls so Ireland could see when they were ready. The preaching continued. 18. Elsewhere than Rhode Island, religious liberty came slowly and by degrees. For example: In Virginia a law was passed permitting one, but only one, Baptist preacher to a county. He was permitted to preach but once in two months. Later this law was modified, permitting him to preach once in each month. But even then, in only one definite place in the county, and only one sermon on that day, and never to preach at night. Laws were passed not only in Virginia but in colonies elsewhere positively forbidding any Mission work. This was why Judson was the first foreign missionary–law forbade. It took a long time and many hard battles, in the Virginia House of Burgesses, to greatly modify these laws. 21. We venture to give one early Congressional incident. The question of whether the United States should have an established church or several established churches, or religious liberty, was being discussed. Several different bills had been offered, one recommending the Church of England as the established church; and another the Congregationalist Church, and yet another the Presbyterian. The Baptists, many of them, though probably none of them members of Congress, were earnestly contending for absolute religious liberty. James Madison (afterwards President) seemingly was their main supporter. Patrick Henry arose and offered a substitute bill for them all, “That four churches (or denominations) instead of one be established”–the Church of England, or Episcopal, Congregationalist, Presbyterian, and the Baptist. Finally when each of the others saw that IT could not be made the sole established church, they each agreed to accept Henry’s compromise. (This compromise bill stated that each person taxed would have the right to say to which denomination of these four his money should go.) The Baptists continued to fight against it all; that any combination of Church and State was against their fundamental principles, that they could not accept it even if voted. Henry pleaded with them, said he was trying to help them, that they could not live without it, but they still protested. The vote was taken–it carried nearly unanimously. But the measure had to be voted on three times. The Baptists, led by Madison and possibly others continued to fight. The second vote came. It also carried almost unanimously, swept by Henry’s masterful eloquence. But the third vote had yet to be taken. Now God seemingly intervened. Henry was made Governor of Virginia and left Congress. When the third vote came, deprived of Henry’s irresistible eloquence, the vote was lost. 23. But even in the United States, the Church and State idea died hard. It lingered on in several of the separate States, long after Religious Liberty had been put into the Constitution of the United States. Massachusetts, where the Church and State idea first found a lodging place in America, has, as already stated, finally given it up. It had lived there over two and one-half centuries. Utah is the last lingering spot left to disfigure the face of the first and greatest nation on earth to adopt and cherish “Religious Liberty.” Remember there can be no real and absolute Religious liberty in any nation where the Government gives its support to one special religious denomination. 24. Some serious questions have many times been asked concerning the Baptists: Would they, as a denomination, have accepted from any nation or state an offer of “establishment” if such nation or state had freely made them such an offer? And, would they, in case they had accepted such an offer, have become persecutors of others like Catholics or Episcopals, or Lutherans or Presbyterians, or Congregationalists? Probably a little consideration of such questions now would not be amiss. Have the Baptists, as a fact, ever had such an opportunity? Is it not recorded in history, that on one occasion, the King of the Netherlands (the Netherlands at that time embracing Norway and Sweden, Belgium, Holland, and Denmark) had under serious consideration the question of having an established religion? Their kingdom at that period was surrounded on almost all sides by nations or governments with established religions–religions supported by the Civil Government. It is stated that the King of Holland appointed a committee to examine into the claims of all existing churches or denominations to see which had the best claim to be the New Testament Church. The committee reported back that the Baptists were the best representatives of New Testament teachings. Then the King offered to make the Baptist “the established” church or denomination of his kingdom. The Baptists kindly thanked him but declined, stating that it was contrary to their fundamental convictions and principles. But this was not the only opportunity they ever had of having their denomination the established religion of a people. They certainly had that opportunity when Rhode Island Colony was founded. And to have persecuted others–that would have been an impossibility if they were to continue being Baptists. They were the original advocates of “Religious Liberty.” That really is one of the fundamental articles of their religious faith. They believed in the absolute separation of church and state. 25. So strong has been the Baptist conviction on the question of Church and State combination, that they have invariably declined all offers of help from the State. We give here two instances. One in Texas and the other in Mexico. Long years ago in the days of Baylor University’s babyhood, Texas offered to help her. She declined the help though she was in distressing need. The Texas Methodists had a baby school in Texas at the same time. They accepted the State help; that school finally fell into the hands of the State. 1. During every period of the “Dark Ages” there were in existence many Christians and many separate and independent Churches, some of them dating back to the times of the Apostles, which were never in any way connected with the Catholic Church. They always wholly rejected and repudiated the Catholics and their doctrines. This is a fact clearly demonstrated by credible history. 2. These Christians were the perpetual objects of bitter and relentless persecution. History shows that during the period of the “Dark Ages,” about twelve centuries, beginning with A.D. 426, there were about fifty millions of these Christians who died martyr deaths. Very many thousands of others, both preceding and succeeding the “Dark Ages,” died under the same hard hand of persecution. 3. These Christians, during these dark days of many centuries, were called by many different names, all given to them by their enemies. These names were sometimes given because of some specially prominent and heroic leader and sometimes from other causes; and sometimes, yea, many times, the same people, holding the same views, were called by different names in different localities. But amid all the many changes of names, there was one special name or rather designation, which clung to at least some of these Christians, throughout all the “Dark Ages,” that designation being “Ana-Baptist.” This compound word applied as a designation of some certain Christians was first found in history during the third century; and a suggestive fact soon after the origin of Infant Baptism, and a more suggestive fact even prior to the use of the name Catholic. Thus the name “Ana-Baptists” is the oldest denominational name in history. 6. Into the “dark ages” went a group of many churches which were never in any way identified with the Catholics. Out of the “dark ages” came a group of many churches, which had never been in any way identified with the Catholics. 2. Its ordinances, only two, Baptism and the Lord’s Supper. They are typical and memorial, not saving. 8. The various churches–separate and independent in their execution of laws and discipline and in their responsibilities to God–but cooperative in work.